Everytime when the kids came back from school in the evening, they would pop into the kitchen to give salam and.. to see what’s mum cooking for dinner. 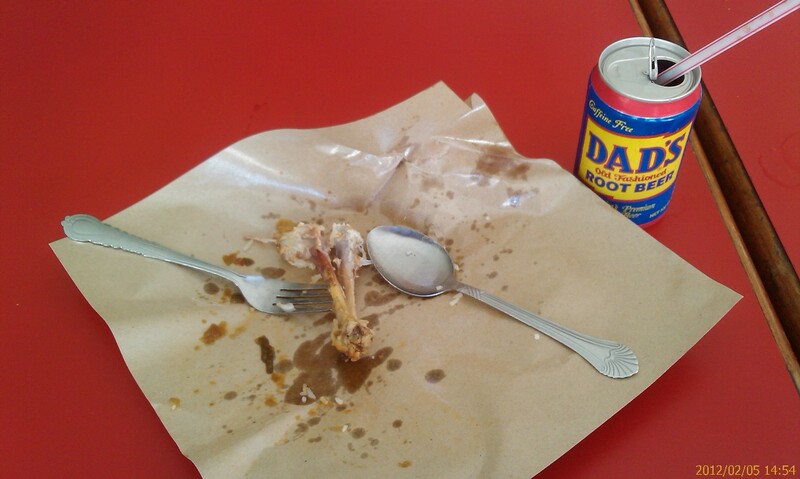 If it’s chicken..it’s yeay! yeay! If it’s fish.. then it’s a “not exciting ok”. Vege’s?? Salad?? It’s only for umi and walid. 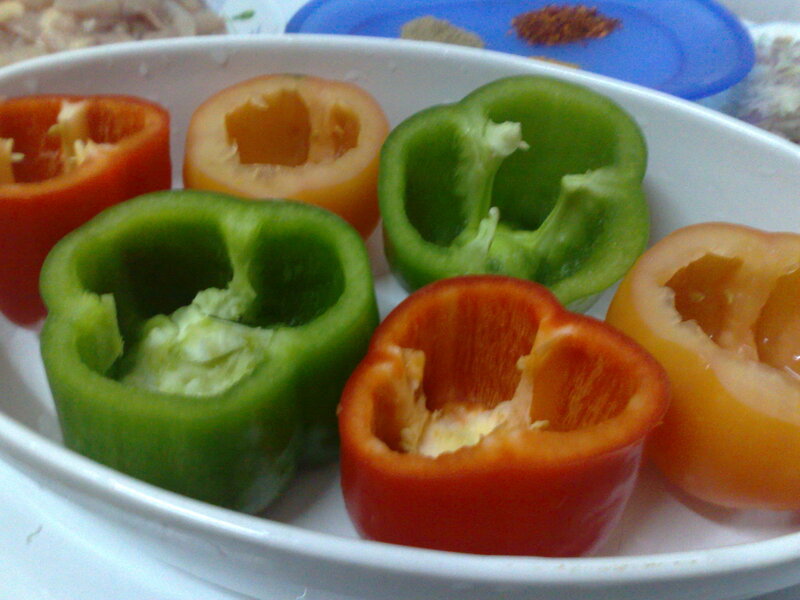 So when I saw these capsicum at the supermarket, I was thinking of stuffed bell peppers I blogwalked sometime back. One for me and another for hubby. For the kids, I decided to put up potatoes (par-boiled first)..but later I found the potatoes are too small to carve a cavity (or maybe I’m not that skillful to make fine carving). So the potatoes was finely mashed , then added milk and butter to it. And to make up the space in the baking dish was tomatoes. Easy to dig out the core. 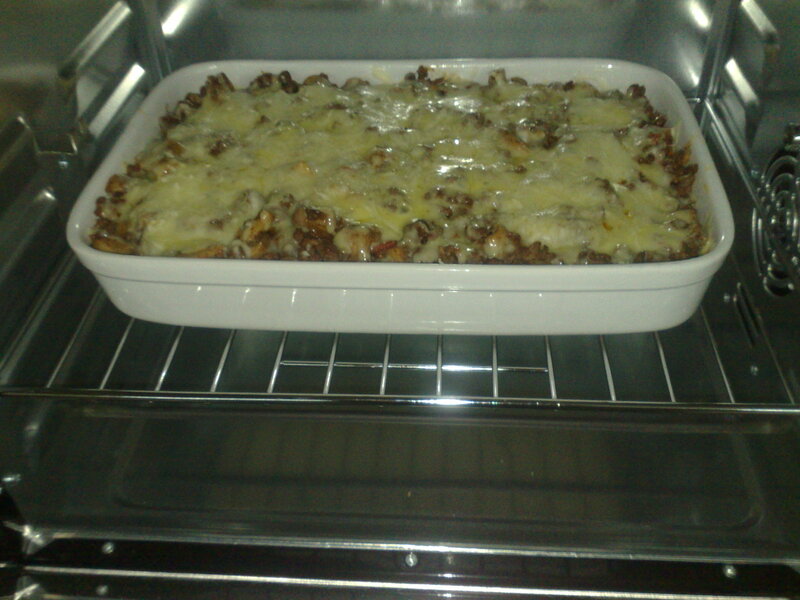 The fillings..I make extras, not just to fill the vegetables, but the baking dish too. VEGETABLES: Wash and pat dry all veges. Cut off the top, spoon out the core and seeds. Green bell peppers(capsicum), red bell peppers (capsicum), potatoes (par-boiled), tomatoes. * The spices I had added was not fiery enough for my asian toungue, to be honest. It would give a little more kicking if I added more chilli flakes..plus ground black peppers or curry powder. But the kids liked it as it is. Marinate cubed chicken with spices for 10 minutes. Then melt butter and add in garlic. Saute garlic till golden brown then add in diced onion. Cook till onions is translucent then add in chicken. Stir and add in some water to moisten. When it starts to boil round the edges, add in cornflour mixture. Cook for another 5 -8 minutes. Let cool slightly, then spoon into veges cavity. 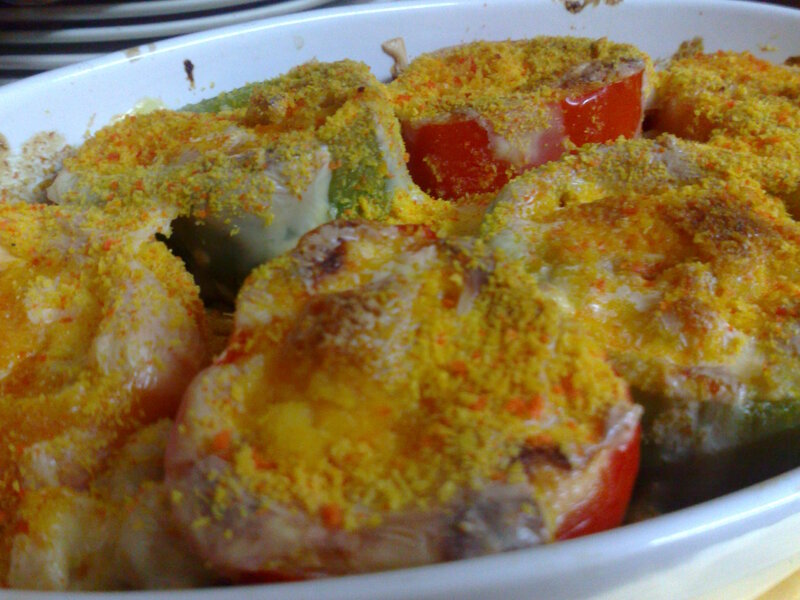 Preheat oven at 180 deg C. Grease a baking dish with butter and arrange stuffed veges. Fill the remaining chicken filling in the empty spaces around the vegetables. 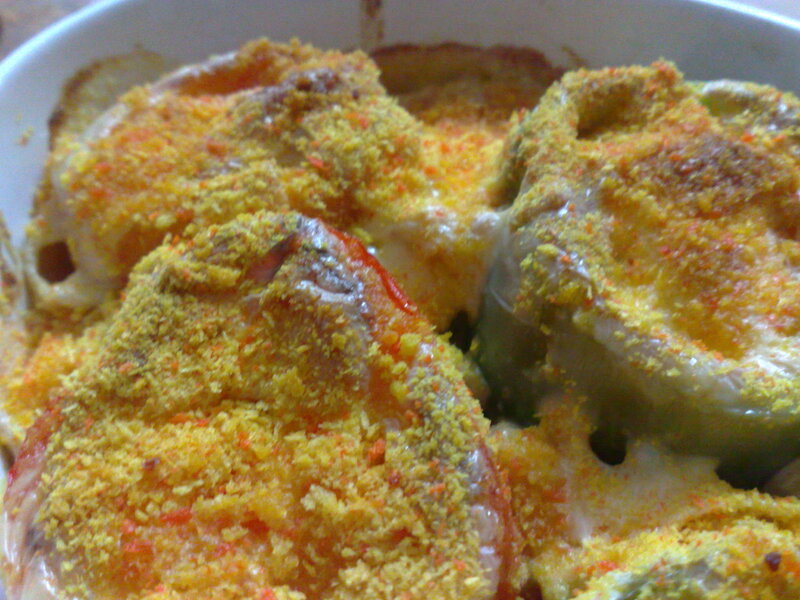 Top with grated cheddar cheese, then sprinkle with golden breadcrumbs. Bake at for 20 minutes or until cheese melts. What is nasi katok?? I have never savoured this meal myself. 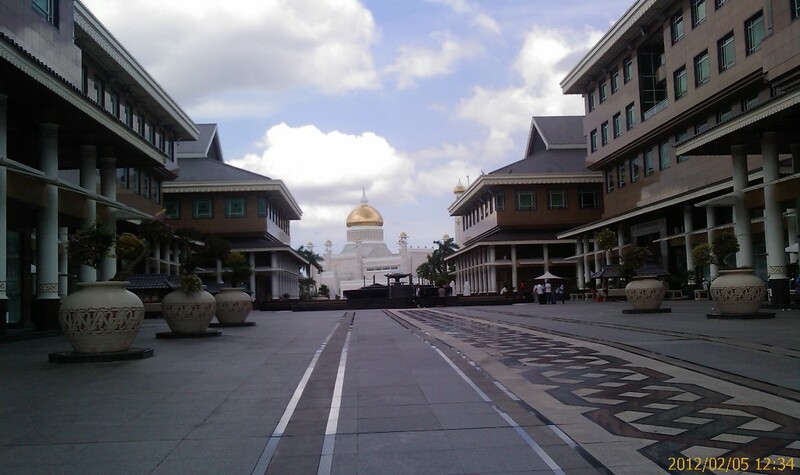 Just the stories my husband brought back from his 2 months stay in Brunei for an assigned job. And .. his first meal was nasi katok. 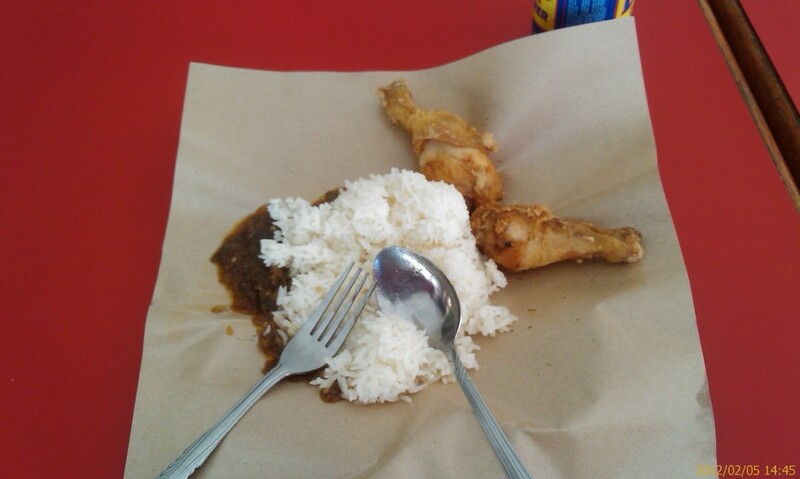 It’s actually a simple meal of rice (they used fragrant rice) and chicken with sambal. 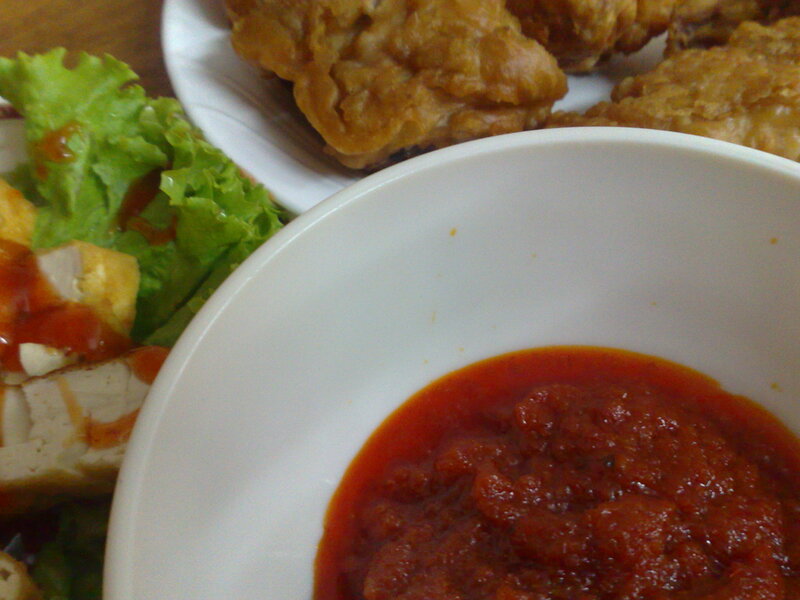 The sambal is either sweet or ‘padas’ (hot/spicy). I can’t say there is one special recipe, because after searching high and low for the recipe… there are so many versions. There’s one which names the sambal as ‘sambal oelek’?? 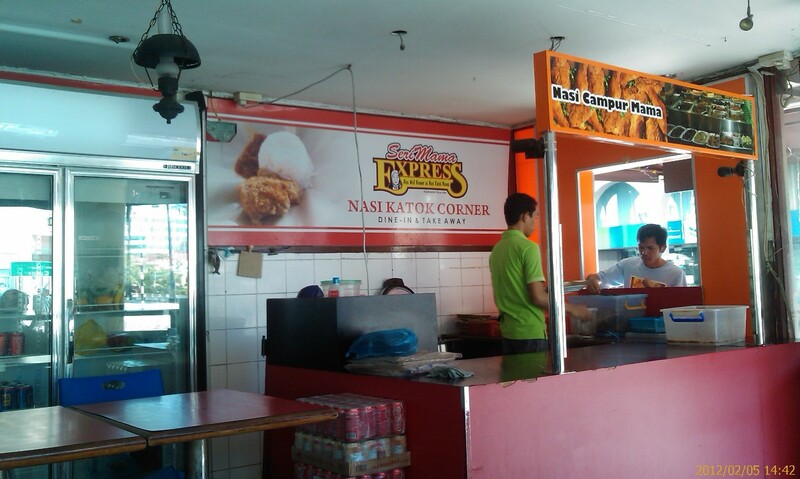 There’s a story behind nasi katok though. I picked up one from a blog. It was started many many years back by a chinese man who sold freshly cooked rice pack meals until late nights from his home. People who wanted to get a meal at this hour would have to knock on the door of his home. That is why it is called ‘katok’ means knock and ‘nasi’ is rice. There are a few more stories , but basically it’s about the same. A tale of a 24 hr readily prepared meal and.. they knock! knock! to get their packet of rice. The best thing is.. It’s 1(one) Brunei dollar which is about RM2.50(ringgit Malaysia). A sigh of relief from an average income Malaysian who has 7 kids.. His initial budget for a meal was BND5 which is about RM13. 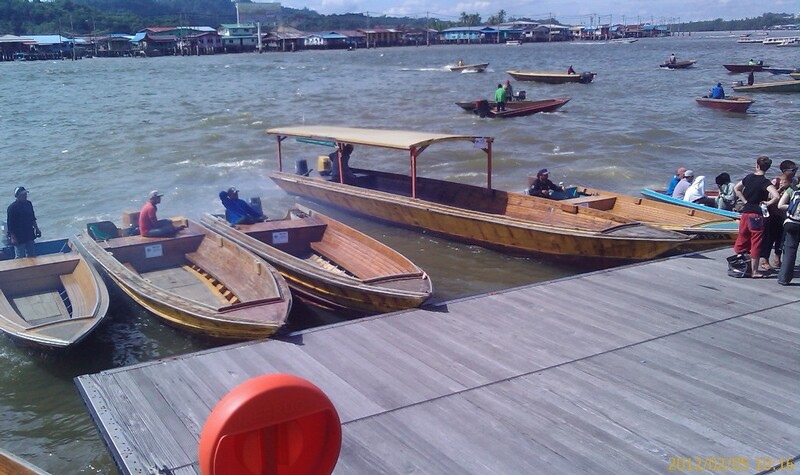 That was before he set foot in Brunei.. now we know that not everything is expensive in Brunei. Well.. he will be leaving again for Brunei soon. Salamat!! My family love pasta. Usually I would prepare spaghetti bolognese or just fry cooked pasta with chilli, meat and vegetables.. Malaysian style. For a change, I’ve prepared our pasta differently. Heat a little oil in a kuali (skillet). Lightly brown garlic then add in onions. Stir until onions is translucent. Add in meat, then tomatoes and mushroom. Cook till almost dry then add in tomato puree. Mix well and add in water. Cook until sauce thickens and add in oregano, salt and pepper. Turn off heat. Melt butter in a saucepan then add in flour. Stir until bubbly about 2 – 3 minutes and add in milk slowly. Stir until sauce starts boiling. Cook for another 4 -5 minutes until sauce thickens. Add in nutmeg and season with salt and black pepper. Turn off heat and add in 30 g grated cheese. Stir until cheese melts. 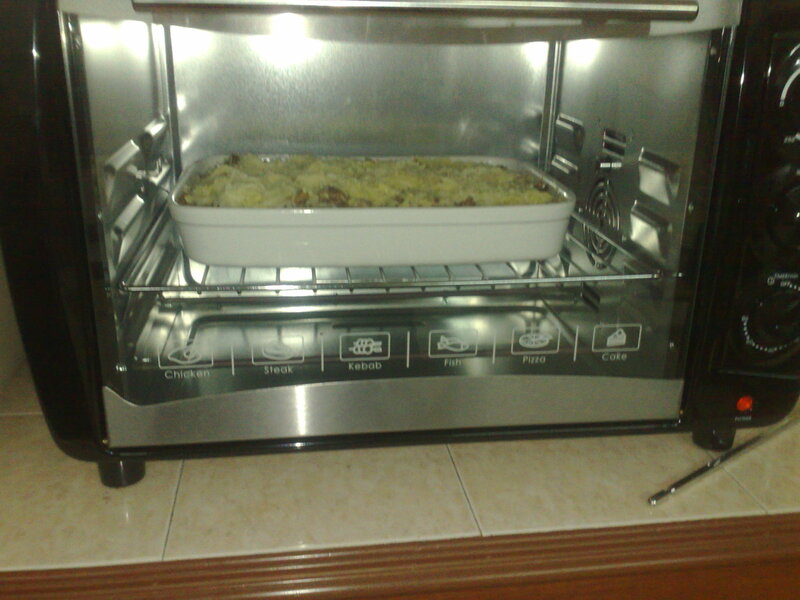 Heat oven to 200 deg C. Grease an oven proof casserole dish. Line in half of the bechamel sauce then scatter in half of cooked pasta evenly. Top with half of the bolognese sauce. Finish off lining with the other half of bechamel, pasta and bolognese sauce. 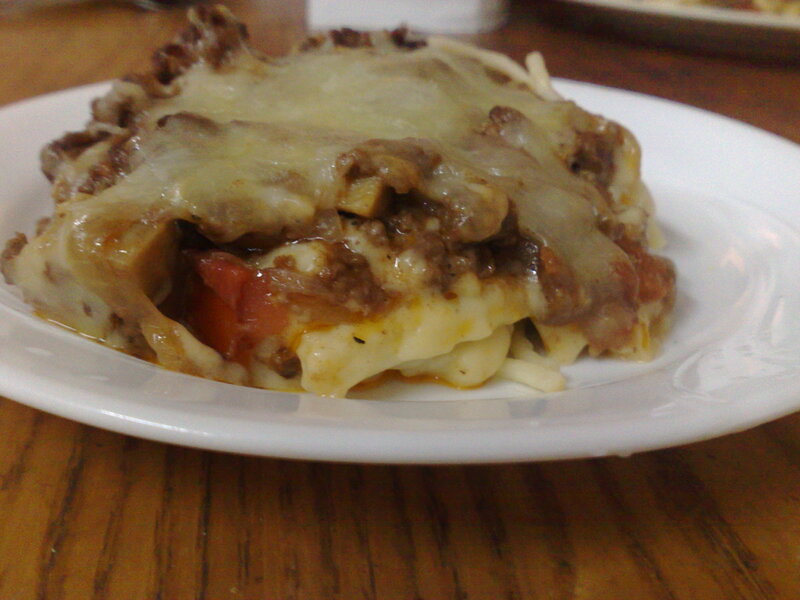 Finally top with remaining grated cheese. Bake in the oven for 20 -30 minutes or until cheese is bubbly and lightly brown. Serve. Marinate meat with garlic, ginger and salt and garam masala if using. 1) Heat 3 tbsp oil in a skillet. When oil is heated, put in cinnamon, cardamon and clove. Stir for a while. Add in onion and saute until onion is golden then add in marinated meat. 2) Fry until almost all moisture has been absorbed. Then add in the rest of the ingredient except lentils. Add in some water and simmer until meat is tender. Add more water if necessary. 3) When the meat is tender, add in lentils or finely ground almond. Add salt to taste then turn off the heat. We had our curry with kulcha. 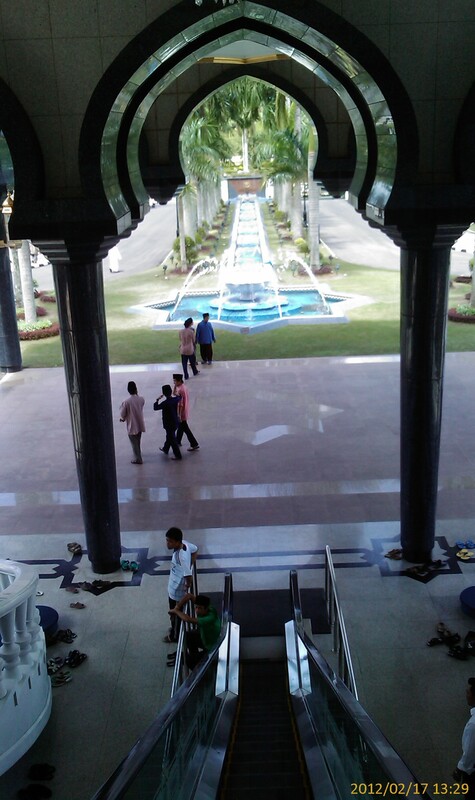 This is the first time we did not “balik kampung” for hariraya. 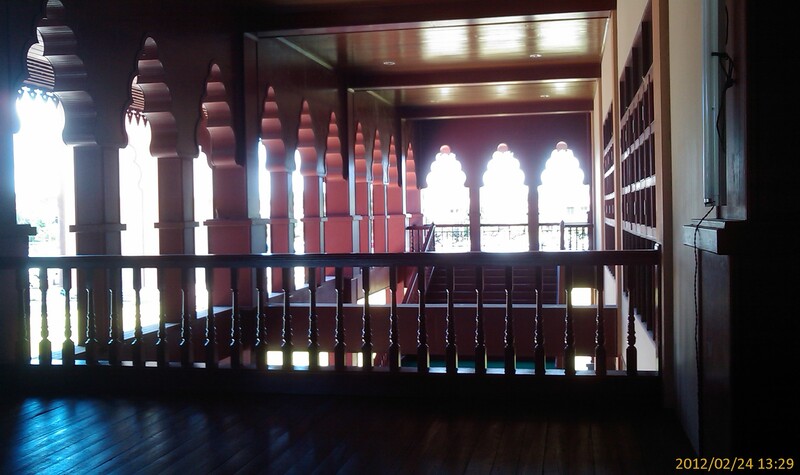 Previously, we would solat raya at our place, then “balik kampung” later in the afternoon. (which is only 40 minutes from our place). But this year, we decided to celebrate in Bukit Sentosa as we had spent the whole week earlier at both (umi/walid) atok’s house. So to get that “raya feel”, umi cooks chicken rendang and nasi impit. 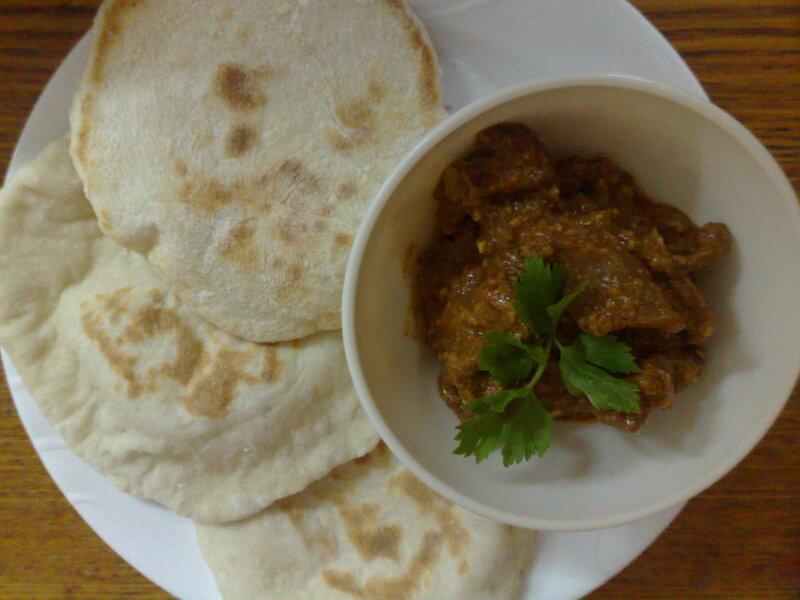 Thought of making kuah lodeh as well, but it seems I made the decision quite late. Pasar is closed, nearby shops are closed and hubby is lazy to go to supermarket in Rawang. So it’s just nasi impit and rendang only after solat raya. But no worry.. 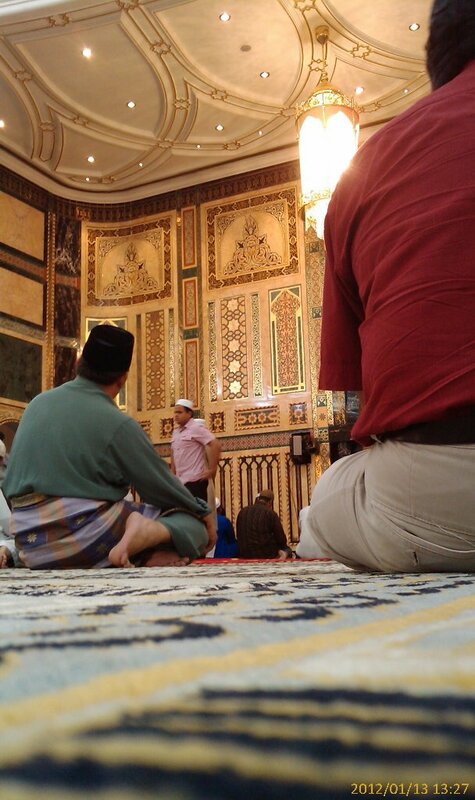 There were sup daging qurban and kari kambing at the surau. 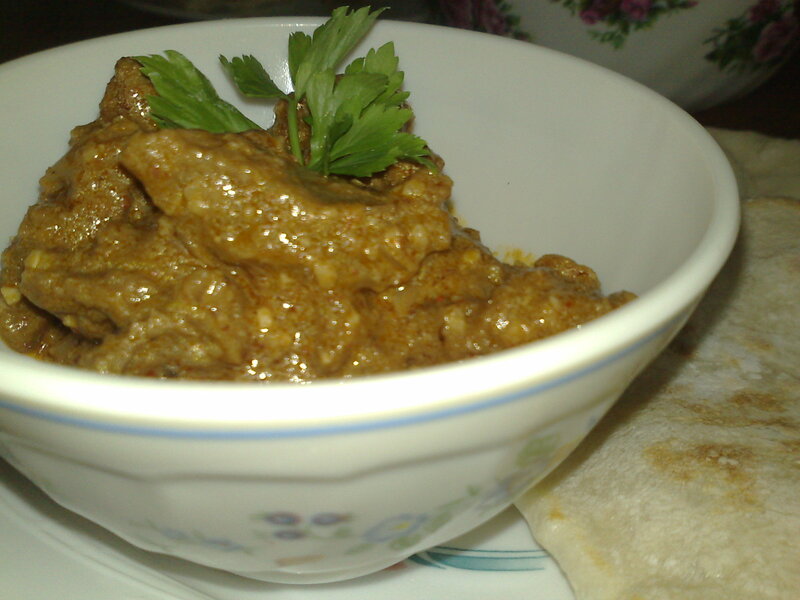 Here’s the recipe for chicken rendang. Heat kuali and put in santan and grounded ingredients A. Stir till mixture boils. Then add in grounded ingredients B. Stir until it starts to boil again, then put in chicken and tamarind. Stir occasionally until chicken is almost cooked, then add in kerisek. Add in salt to taste and continue to cook until chicken is done. 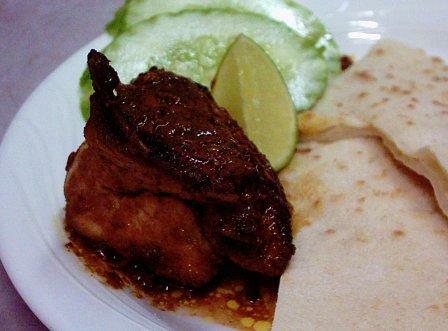 This tandoori chicken recipe is from “Dari Dapur Zarina” recipe book. Make deep slashes on the thick parts of the chicken. 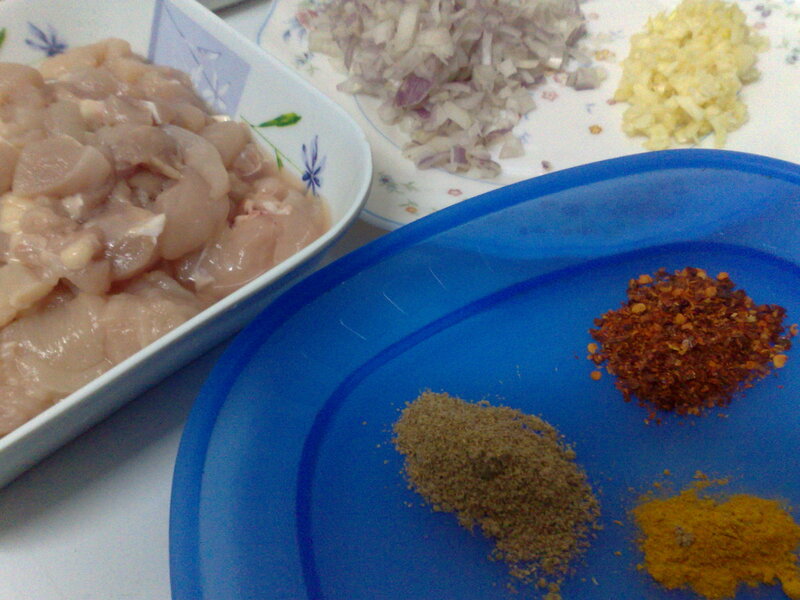 Coat the spice mixture on the chicken and its inner part. Marinate for a whole day or at least 6 hours. Heat the oven to 225 – 250 deg C. Brush a little bit oil onto the chicken and grill for 1 hour or until cooked. Baste occasionally with remaining marinade. Serve with slices of cucumbers, tomatoes, lemon and mint dressing.